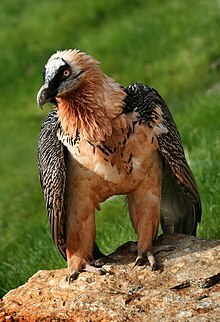 The bearded vulture (Gypaetus barbatus), also known as the lammergeier or lammergeyer, is a bird of prey. It is the only member of the genus Gypaetus. An Old World vulture, it forms a minor line of the Accipitridae with the Egyptian vulture, its closest living relative. They are not much more closely related to the Old World vultures proper than to hawks. They differ from Old World vultures by their feathered neck. It eats mainly carrion and lives and breeds on crags in high mountains in southern Europe, the Caucasus, Africa, the Indian subcontinent, and Tibet. The females lay one or two eggs in mid-winter that hatch at the beginning of spring. Populations are resident. This page was last changed on 23 August 2017, at 00:33.